If you’re looking for some adventure in our backcountry, we have more than 20 miles of trails waiting for you to discover by foot, horseback or on the seat of a mountain bike. We even have complimentary mountain bikes and helmets for you, including full-suspension adult BMC and Giant mountain bikes and Giant mountain bikes for kids. Every inch of our loop trail system was masterfully designed and built by Alpine Trails, one of the nation’s most experienced and respected trail builders. They’ve been building the premier mountain biking trails in and around Park City for more than two decades, and have completed over 400 miles of trail in that area alone. Start on the Kamloop Trail and be on the lookout for local wildlife as you warm up with a friendly 3% grade. When you’re ready for a challenge, take on the Fremont Trail and its 5%-7% climb grades. A hard uphill climb will reward you with views of the Uinta and Wasatch Mountains, Kamas Valley and all of Victory Ranch itself. An epic downhill plunging through a grove of aspens should give you enough time to decide if you want to go for another loop or not. The trails are endless at Victory Ranch, and so is the fun you’ll have on a Fat Bike. From the Groomed Nordic Tracks to the Kamloop Trail, you can zoom past the still life in the backcountry, or stop and enjoy picturesque views of the Upper Provo River, Deer Valley Mountain and the Fitzgerald Ponds. 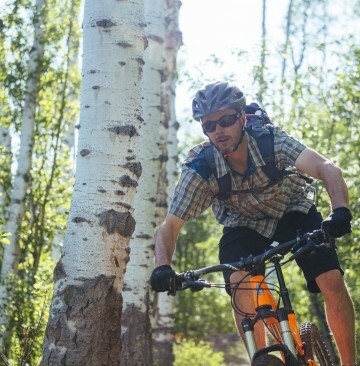 A growing trend among mountain biking enthusiasts, the Fat Bikes were born from a need to cruise endless terrain throughout the seasons with ease and stability. The oversized tires allow riders to traverse across snow, sand and pavement thanks to greater surface area to absorb shock and provide grip-like traction. The Victory Ranch trail system is a hiker’s paradise. Explore the native flora on foot along meadows, draws and aspen groves, and keep your eyes peeled for our winged residents, like the mighty Golden Eagle. For those who like to pick up the pace a little and trail run, our flow trails offer miles of single tracks to get your heart pumping as the views of the surrounding mountains take your breath away. Our Outfitters team can arrange a horseback riding excursion you won’t soon forget. Set out from the Kamloop trailhead along the Fitzgerald Ponds for a scenic trail ride in the fresh mountain air. Feel the call to explore thick groves of aspen and trot along wooded trails in our expansive backcountry. Trail rides can be arrange for both small and larger groups, and for all experience levels.